Wait, don’t leave! Just doing a little philosophical experiment here. There is a striking analogy going on, or allegory, with possibly revolutionary consequences, and definite relevance for renewables.. 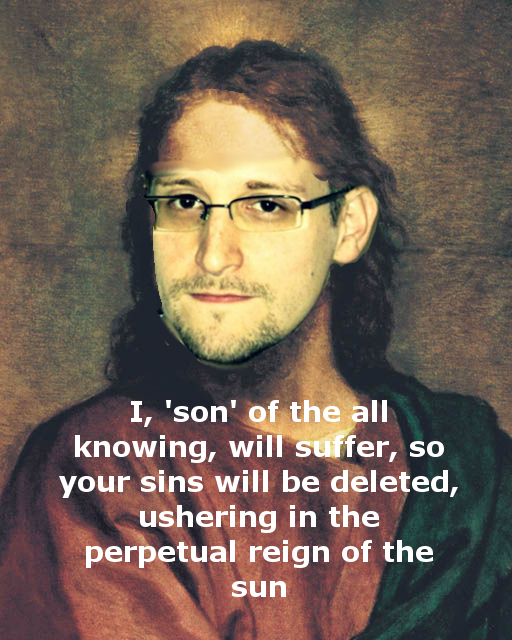 The first messiah was a son of God, the almighty and allknowing..
Snowden worked for the NSA, Homeland security, US defence (as a subcontractor), was the NSA all knowing? Apparently yes, and almighty? Linked to DoD, FBI, CIA? Ask Michael Hastings, Aaron Schwartz.. So that being established, the first messiah died for our sins, so they be forgiven.. Already the chase of Snowden is causing a backlash and investigation into what facts, events, communication is recorded and kept for future prosecution. We are already seeing demands for removal of data to be deemed ‘sins’ before the law. At the same time the facts about corporate spying, covert actions using the same infrastructure are coming out, and will mean a backlash against those companies (some named specifically in a UK study, Shell, Nestle, McDonalds). The ‘sins’ of those companies will probably not lead to prosecutions, but there must be movement to ensure that nobody records anything that constitutes an invasion of privacy. Information that could otherwise be used to construct a case if the individual in question turned out to be a threat to any of the big companies (we are not talking terrorisme here). Not only our sins will be forgiven if as a result of public awareness of data retention data is deleted, but it will also end an unfair advantage of big corporations, it wil mean an end to the carbon credit dominance, the rule of big oil over the market, because ultimatly big oil, carbon, coal and gas are needed to keep the global economy going, they are the drivers and and beneficiaries. To keep the oil being wasted in or for the US they needed the surveillance, eavesdropping, on whoever threatened the rule of these companies. Awareness of surveillance and data retention may break the power of these companies, especially when it is paired with a cleanup of the banking sector, something that seems to be happeninge as the US loses trust around the world. People like Max Keiser will tell you all about it. What all this means is a fair playing field for people to improve their fate. Renewables will win because there is so much potential, and harvesting is becoming easier and easier. Simple techniques like contour trenching can restore farmland in dry areas, the renewable industry will certainly benefit from less corporate spying, less speculation because it is intrinsically productive, as opposed to carbon economic activities, that usually consume carbon. Wealth means peace, energy security means no need to antagonize Iran, no need to stoke war in Syria, no need to suppress other countries over their resources. Snowden can be the cathalist to usher in an era of unhampered renewable energy growth driven by humanities desire to live in peace and prosperity..